Evel Knievel is possibly the most famous motorcycle daredevil who has ever lived. Even people who weren’t alive in the 1960s and 1970s at the peak of his fame know the name “Evel Knievel.” However, behind the character was a complicated person named Robert Craig Knievel. 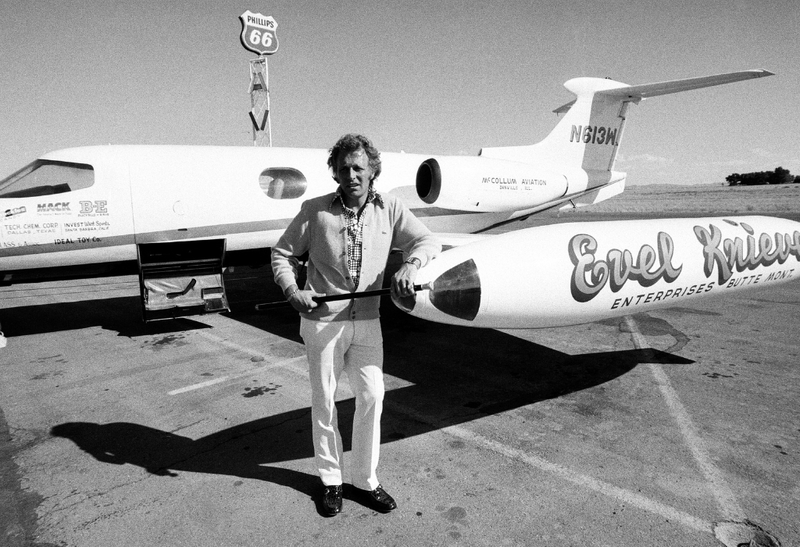 From the origins of his strange name to the surprising world record that he holds, there’s more than meets the eye with Evel Knievel. 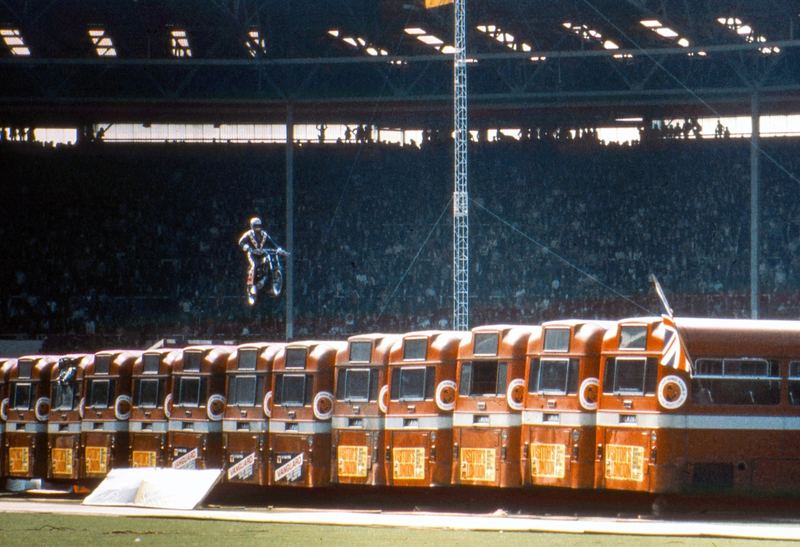 Read on to learn some high-flying facts about the legendary stuntman. Knievel and his eventual wife Linda Joan Bork had a rocky start. In 1953, he kidnapped her and was actually charged with a crime. Six years later, he did it again, but this time, they rode off on his motorcycle to get married. Against all odds, they actually stayed together for 38 years. The couple even had four children — two boys, Kelly and Robbie, and two girls, Tracey and Alicia. In his early 20s, before he became a famous stuntman, Knievel founded a semi-professional hockey team in his hometown called the Butte Bombers. Using his savvy sales skills, Knievel managed to convince the 1960 Olympic Czechoslovakian hockey team to play them in a warm-up game. When the Czech officials went to the box office to collect their payment, they found no money or receipts waiting for them. Obviously, the Czechs weren’t happy, and the United States Olympic Committee had to pay the team to avoid an international incident. In 1977, a man named Shelly Saltman released a book that painted Knievel in a very unflattering light. Angry by the book, Knievel set out to get revenge on Saltman. He tracked Saltman down and beat him within half an inch of his life with a baseball bat. 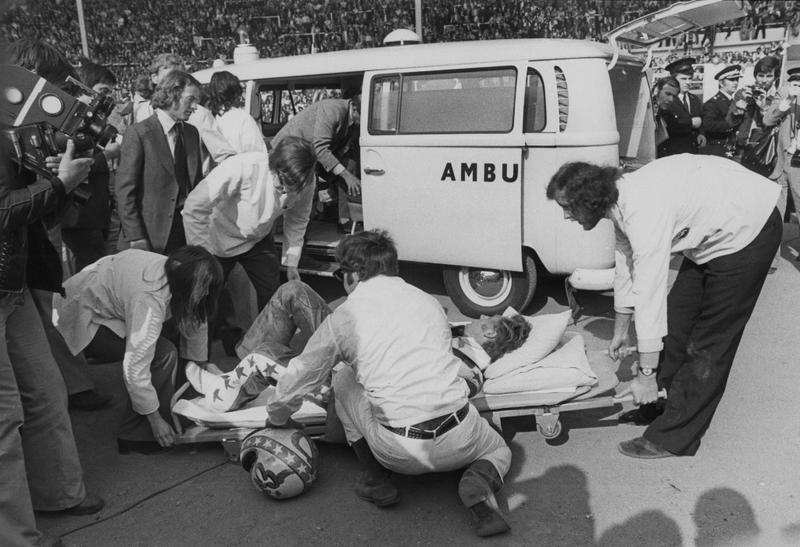 The miraculous thing about this awful attack is that at the time, Knievel had two broken arms. He had one of his cronies hold Saltman down while he awkwardly swung a bat at him while his arms were in casts. Most kids nowadays learn to drive their parent’s old pickup trucks on backroads or by using golf carts at the local mini putt. 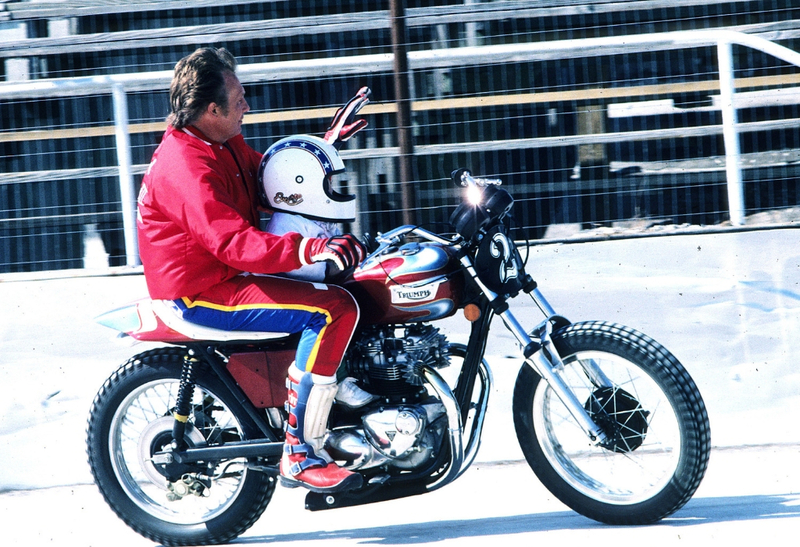 Knievel bypassed driving cars and went straight to riding motorcycles. 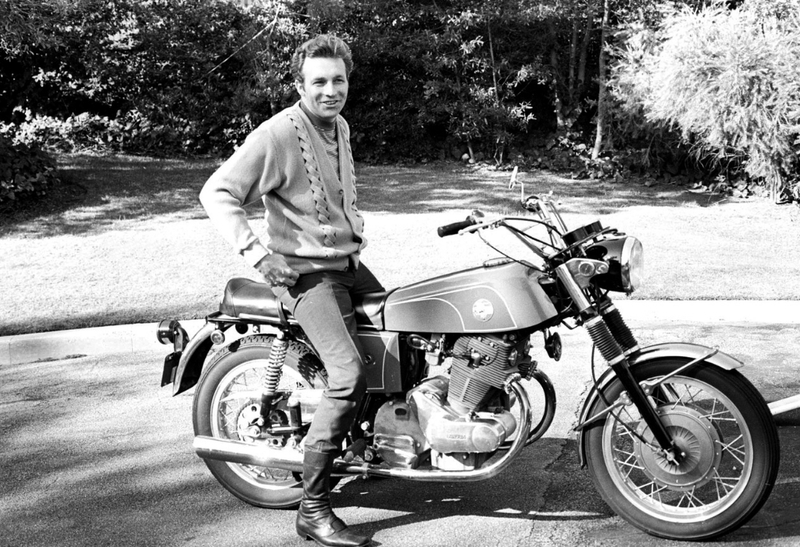 According to his biography, motorcycle riding seemed to come naturally to him. On his first ever motorcycle ride, he already had the daredevil spirit in him. Knievel immediately began showing off and ended up crashing the bike into a neighbor’s garage. Considering the fact that Knievel had done some unsavory things with some cronies, it’s not surprising that someone as high-profile as him had the FBI on his tail. The FBI followed him for nearly a decade and found that he was the mastermind behind several beatings of rival daredevils. Knievel was never formally charged with anything, but he definitely had to keep calm and maintain a low profile after his retirement. 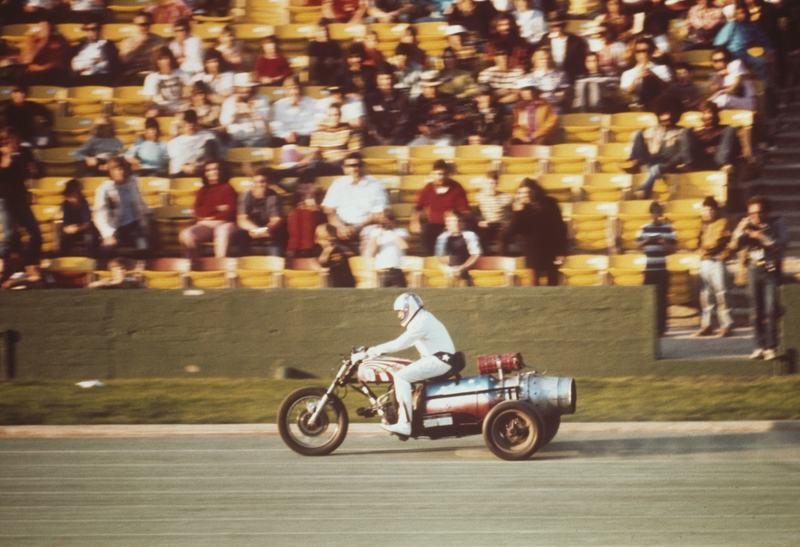 As soon as Knievel got his first taste at motorcycle riding, everything else seemed to be “unimportant stuff.” He left his high school in Butte, Montana during his sophomore year to work, but that only made things worse. His first job out of high school was working in the copper mines as a diamond drill operator. It didn’t take long for Knievel to get fired after he popped a wheeling on the earth mover. As a young man, Knievel would often illegally poach elk in Yellowstone Park. At the time, hunting wasn’t legal, but park rangers would have to cull elk anyways to control the population. After getting several warnings, Knievel became upset and wanted the hunting rules to change. Knievel ended up going to the White House with a pair of elk antlers for President Kennedy as a gift. He never did meet JFK, but after yelling at some congressmen on Capitol Hill, they changed the hunting laws in Yellowstone Park. 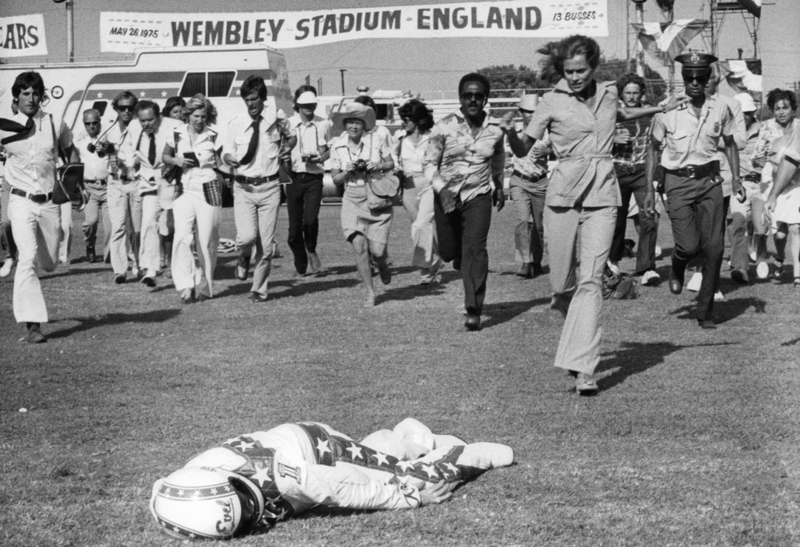 Unsurprisingly, Knievel is the proud owner of a world record that absolutely no one else would want to break. 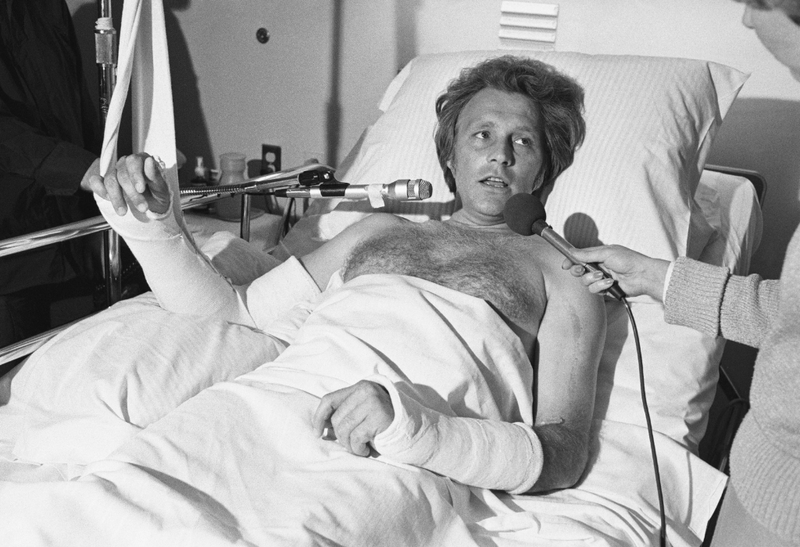 By 1975, Knievel had crashed more than 20 times and suffered 433 broken bones or fractures. Those fractured bones include his skull, back, pelvis, nose, hips, and both arms. 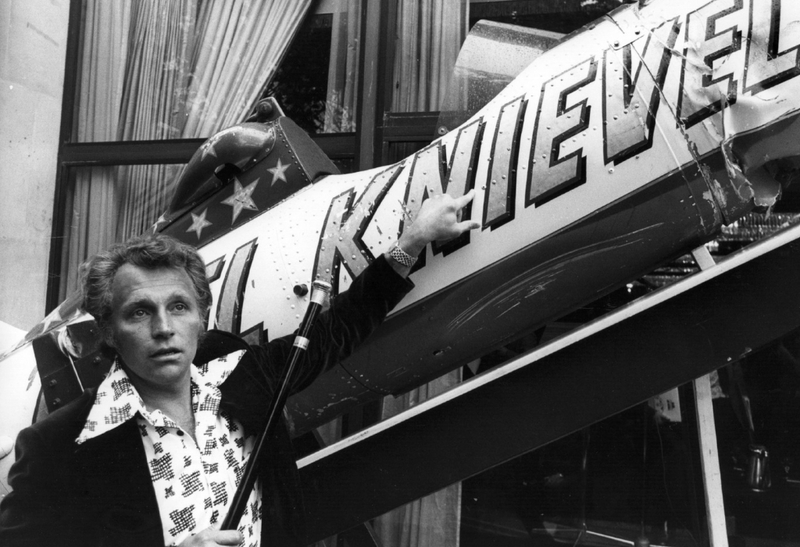 Knievel’s son claims it was much less and that his father only ever broke 40 or 50 bones. Knievel himself says he only broke 35 bones. For his first stunt, Knievel agreed to try and jump over two lions and a box of snakes in order to save a local Honda dealership. The turnout was huge and thousands watched Knievel dramatically fall into and break open the box of snakes. 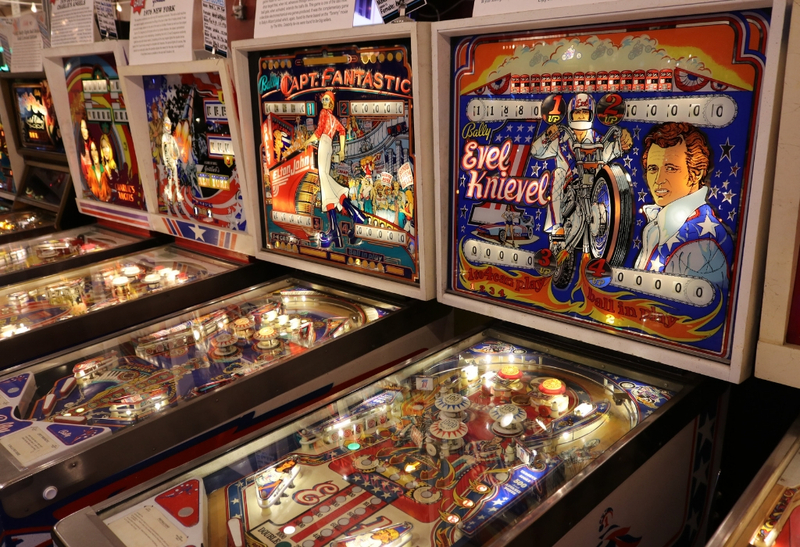 The angry snakes inside the box started moving towards the crowd and hundreds of shocked fans went home and told everyone about the stuntman called Evel Knievel. 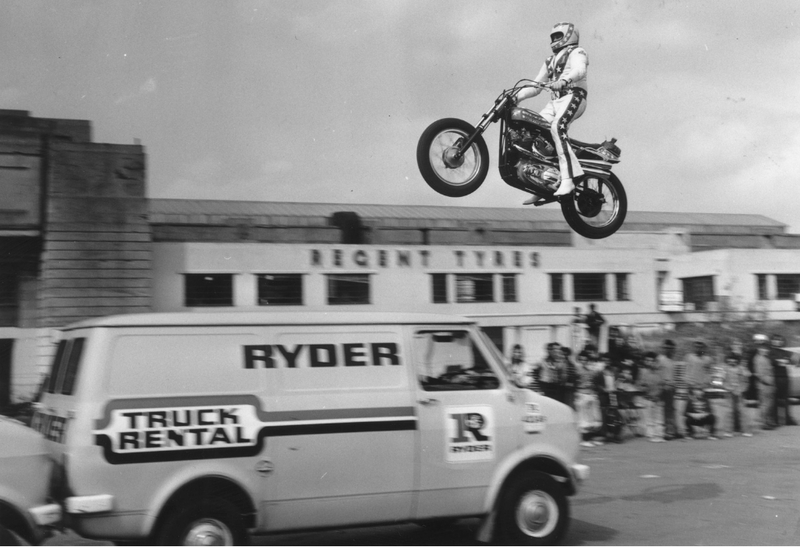 For years, Knievel worked in sales and was quite successful. He worked as an insurance salesman and eventually moved on to selling what he was most passionate about — motorcycles. One of his sales tactics would be to offer anyone $100 off the price of their motorcycle if they could beat him at arm wrestling. Knievel later wrote in his biography that no one could beat him and i inspired his showman personality to grow. 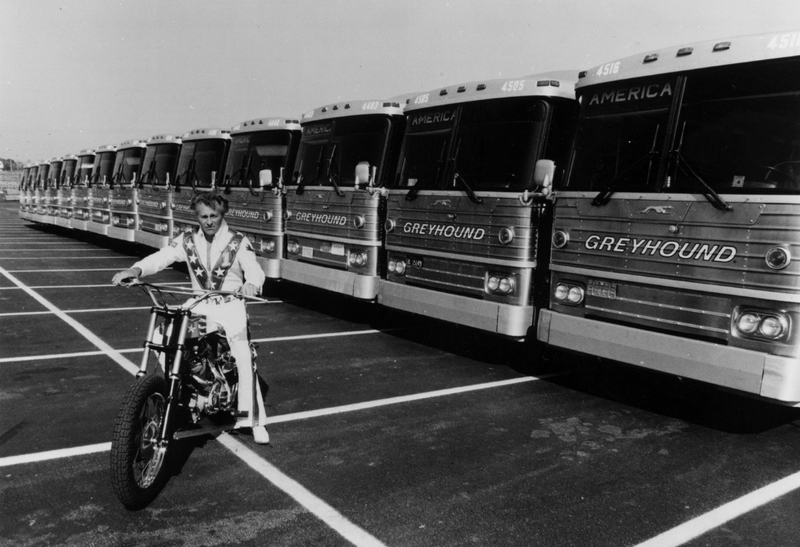 Knievel knew that his stunts would inspire hundreds of copycats young and old. He also knew that he crashed just as often as he successfully completed the jumps. Knievel then decided that he would always be shown wearing a helmet if the bike was in motion. He even went so far as to make sure a helmet was on in promotional stills. Throughout his entire life, Knievel was an advocate for helmet laws and spoke on Capitol Hill to get a mandatory helmet bill passed. Knievel was very conscious of his image. Everything from wearing a helmet to his iconic red, white, and blue bodysuit was thought out. Since he had already changed the spelling of “Evel” so he didn’t sound like a bad person, he figured he’d do the same with his outfit. In the ’60s and ’70s, most bikers were considered to be gang members who wore black leather. 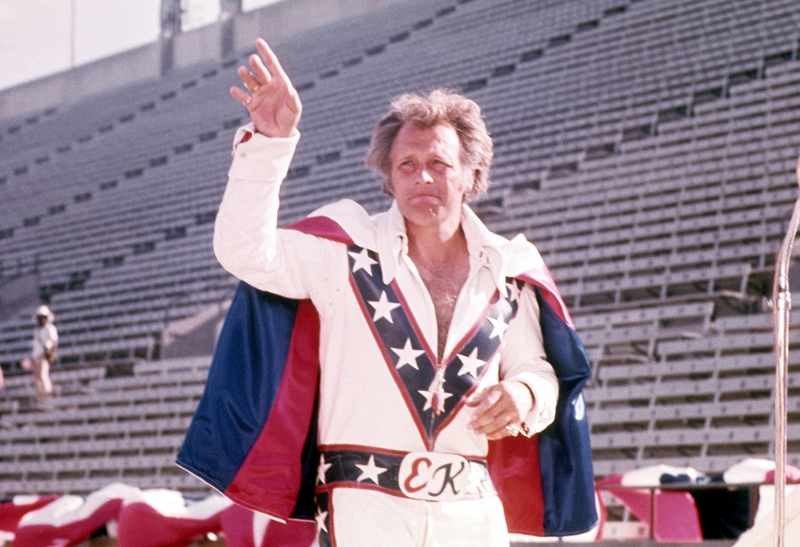 To fight against that image, Evel went with the patriotic red, white, and blue jumpsuit. 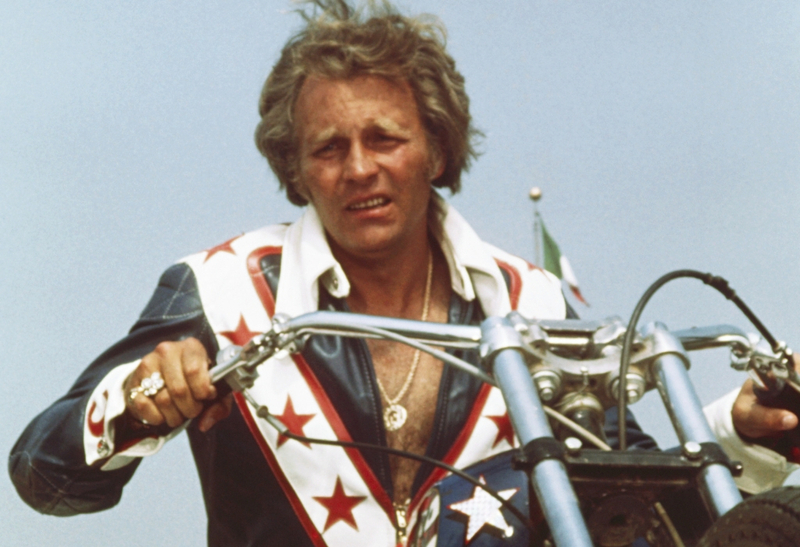 We know that Knievel chose red, white, and blue clothing instead of black leather so that he wouldn’t look intimidating, but what about the flamboyant jumpsuit? Knievel said that his main inspiration for his bell-bottomed, winged, bedazzled jumpsuit was none other than legendary showman Liberace. 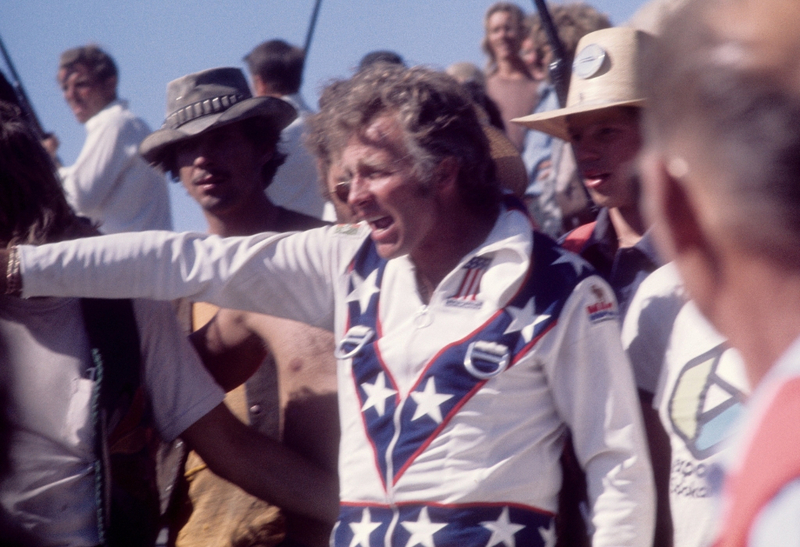 Even though Knievel might seem macho, tough, and rugged, he had a flair for standing out and wanted everyone to know he was a star. Another one of Knievel’s core beliefs was that he hated drugs. 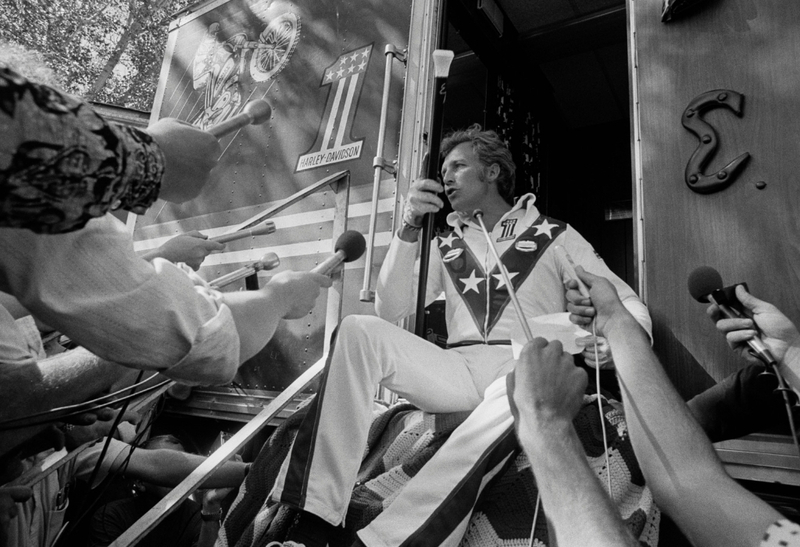 During his shows and in his personal time, Knievel would preach anti-drug messages to both children and adults. He particularly hated that drugs were associated with motorcycles thanks to biker gangs like the Hells Angels. At one point, a near-riot even broke out between Knievel and a group of Hells Angels threw a tire iron at one of his shows. 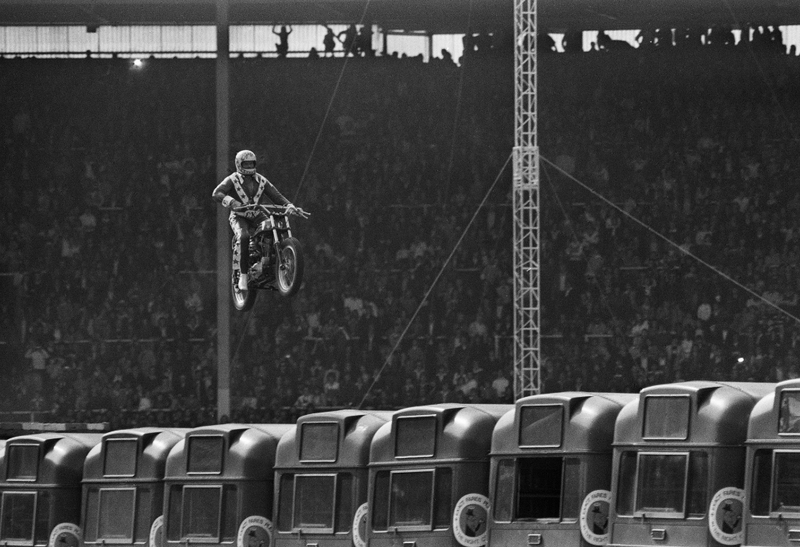 His daredevil career began to take off when Knievel created a troupe of like-minded individuals. They called themselves the Evel Knievel Motorcycle Daredevils and would tour the midwest showing off their act. 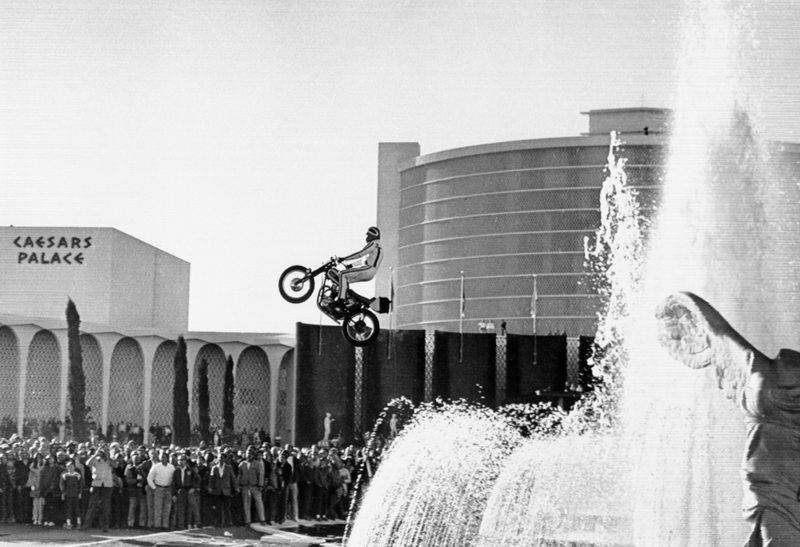 In 1968, Knievel jumped the fountains in front of Caesar’s Palace in Las Vegas as a publicity stunt for the hotel. Unfortunately, he sailed 151 feet in the air and cleared the fountains, but had a horrific crash at the end. He ended up breaking his pelvis, hip, multiple ribs, and was in a coma for 29 days. The failed jump was broadcasted on ABC and made him a household name. 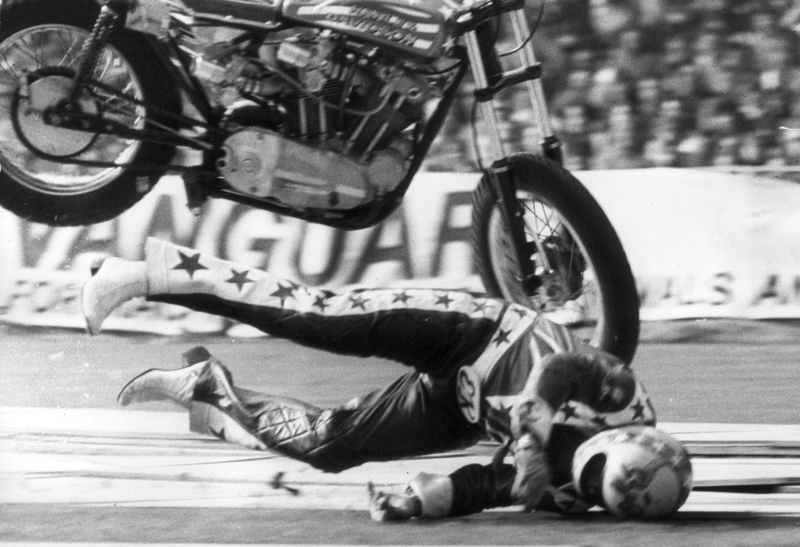 It seems like Knievel’s greatest asset was his failures. Even after a career spanning decades and numerous successful jumps, Knievel still claims not to know how to gauge a jump. He has admitted that every stunt he did was his own “guesstimate.” Knievel even went as far as to admit that he doesn’t understand the science or math behind the daredevil jumps. In other words, the world’s greatest motorcycle stuntman had absolutely no idea what he was doing, and he still pulled it off. 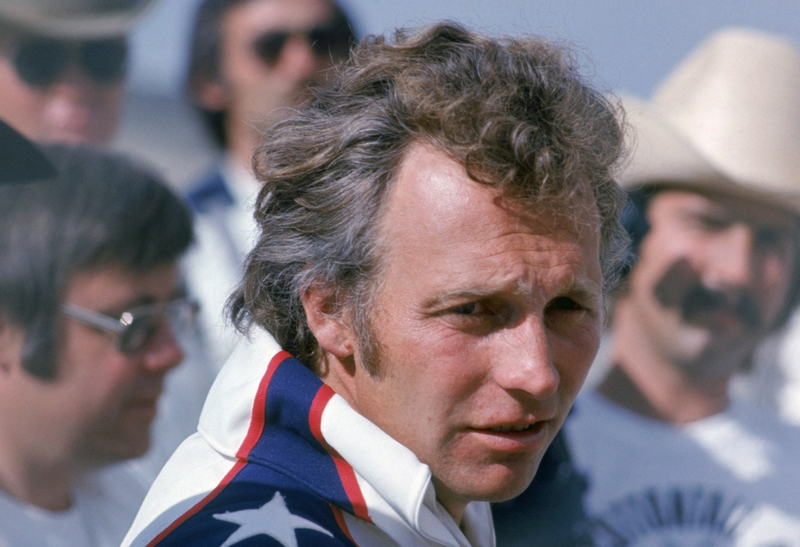 At the height of his career, Knievel was earning $25,000 per jump. Adjusted for inflation in today’s money that’s about $162,000 per jump. And from 1972-1975 he was averaging one stunt per week. Of course, some jumps paid him more money and he often got a cut of ticket sales. In 1971 he sold over 100,000 tickets for back-to-back shows at the Houston Astrodome. 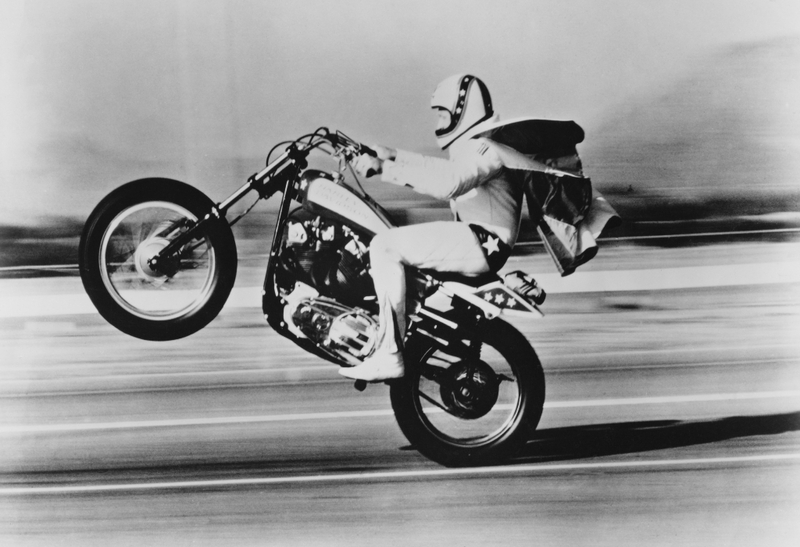 It’s no wonder that when Knievel finally retired, he had a net worth of nearly $3 million. One of the greatest continuing rumors throughout Knievel’s career was whether or not he would jump the Grand Canyon. In 1968, after the Caesar’s Palace crash, Knievel admitted his dream was to jump the Grand Canyon. He even went so far as to say that he wants to be the first to do it. Unfortunately, the Interior Department never allowed him to use the airspace and so he never got to jump the Grand Canyon. 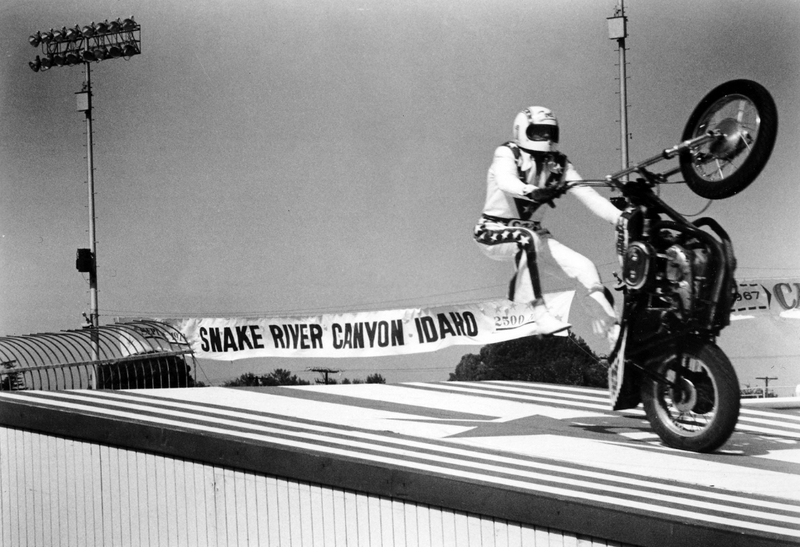 When Knievel was denied the rights to jump over the Grand Canyon, he settled on jumping the Snake River Canyon. Knievel even had a contractor build a rocket-like car called the Skycycle X-2 that would function more like a rocket than a motorcycle. Knievel technically made the jump, but the Skycycle’s parachute combined with the northwest winds and dragged it back into the canyon. The Skycycle floated down into the canyon and thankfully didn’t land in the water, or else Knievel would likely have drowned. While he made it out alive, many believe he was never confident in his abilities again. 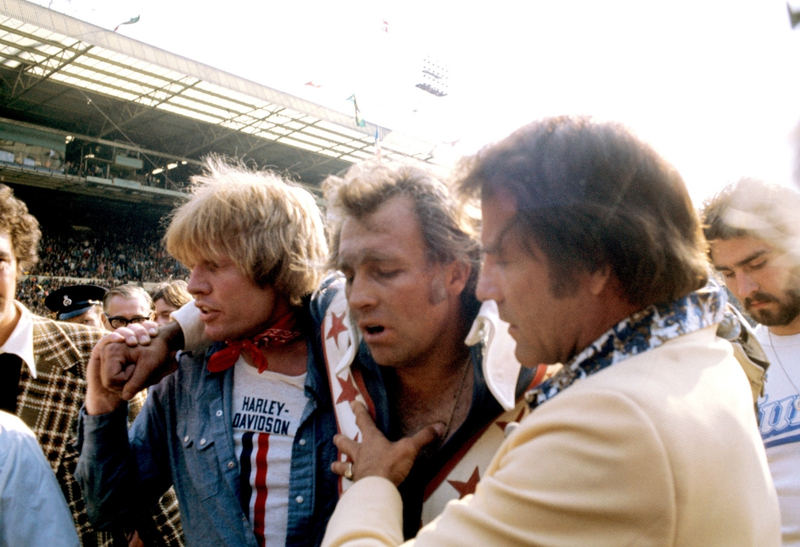 On May 26, 1975, Knievel crashed in front of 90,000 people at Wembley Stadium in London, England. He was attempting to jump 13 double-decker London buses but failed. 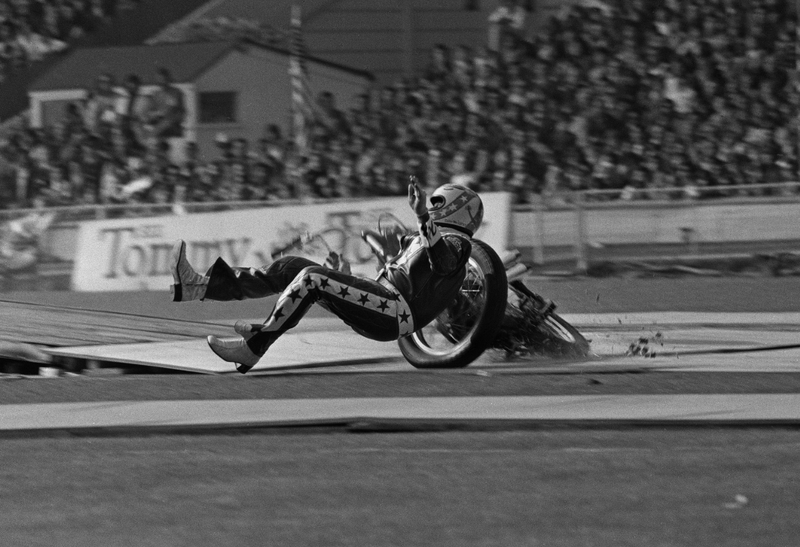 Knievel ended up breaking his pelvis in the crash and this was the moment that pushed him over the edge. In the late-90s, it was discovered that Knievel had Hepatitis C that was tearing apart his liver. Knievel was put on the waitlist for a liver and finally, on February 2, 1999, he was told a liver was available. When Knievel went into the hospital though, he learned that there was a younger child much lower on the list than him with the same blood type who had just taken a turn for the worse. 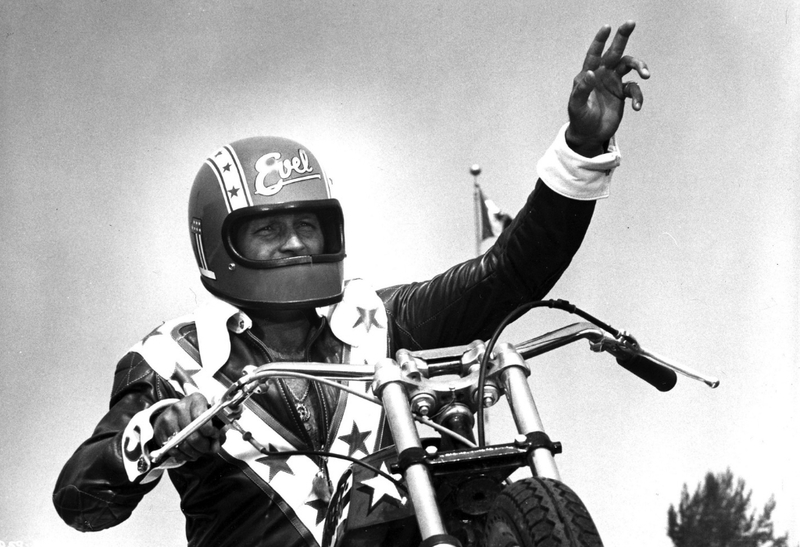 Knievel walked out of the hospital and said he felt fine so that the liver could go to the child. In 2003, Knievel signed over the exclusive rights to his life story and biography so that a Los Angeles composer could turn it into a rock opera. The show opened in Los Angeles in September 2007 to some surprisingly positive reviews. 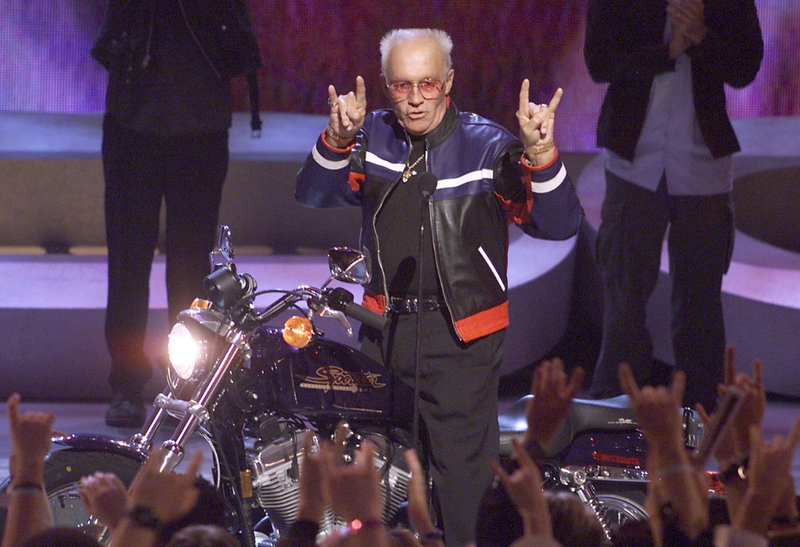 Knievel said that the rock opera was a “wonderful compliment” and that he approved of and enjoyed all seven of the songs the composer wrote for the rock opera. 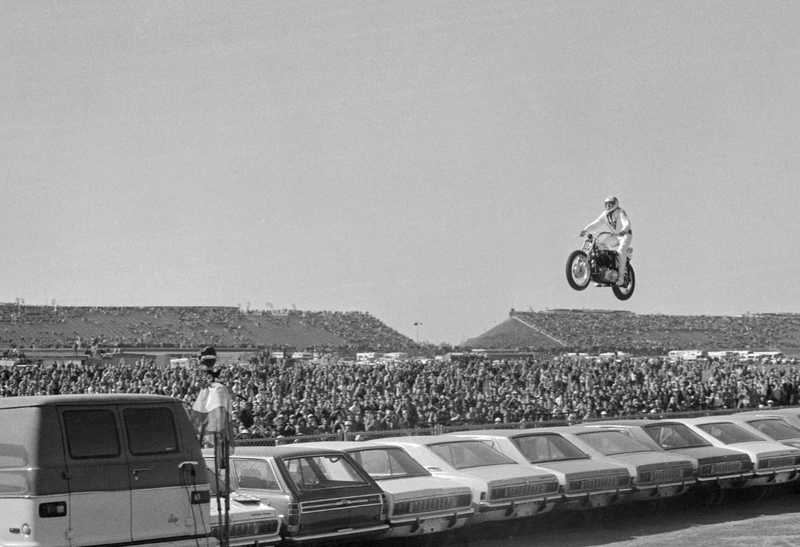 Ramp-to-ramp jumps were Knievel’s specialty. It basically meant that he jumped off one ramp, flew over a bunch of dangerous or large objects, and landed on another ramp. He got his start jumping primarily over cars as a promotional stunt and would jump over cars for 80% of his stunts. His record is jumping over 22 side-by-side cars but some say he only cleared 21 of them. But what’s one car in the grand scheme of things? At the peak of his popularity, there were even Evel Knievel action figures and toys sold in stores. From 1972-1977 you could go to your local department store and find collectible figures with a working bike and accessories. If you’re still an Evel Knievel fan and want a figurine as a collectible, you can still find a handful of them on the Internet. You just have to pay a pretty penny for it. When your career is all about putting your life on the line, there’s a good chance you’ll spend most of the time recovering. We know Knievel broke either 35, 45, or 433 bones, and he spent about 3 years in the hospital recovering from those issues. Basically, he was either performing stunts or recovering from them. Even after he retired he spent time in the hospital after a stroke, lung disease, spinal-fusion surgery, and a liver transplant. 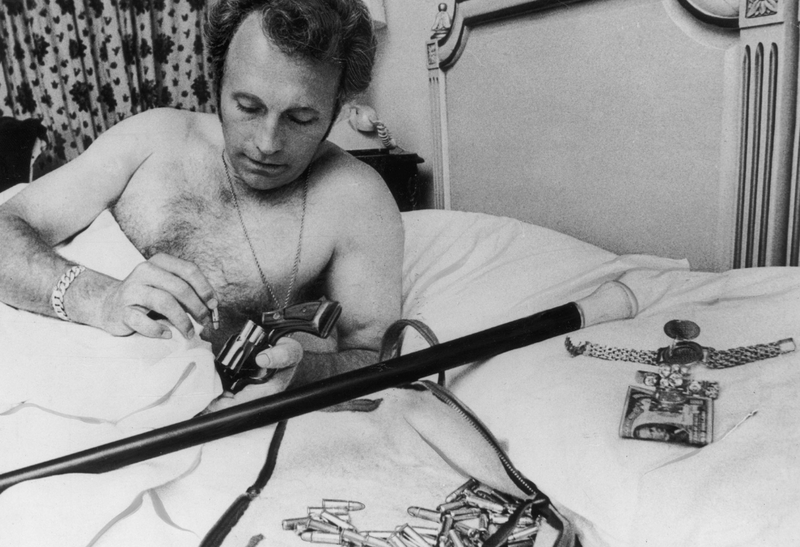 To no one’s shock or surprise, all that fame and money wasn’t exactly in good hands with a daredevil like Knievel. He wasn’t exactly conservative with his money and ended up going through multiple serious financial struggles. At one point, he actually had to sell off two of his yachts and a bunch of mink coats to pay for his hospital bills. It seems like the daredevil profession doesn’t come with health insurance. Hollywood actor George Hamilton was set to star in a feature film about Evel Knievel. 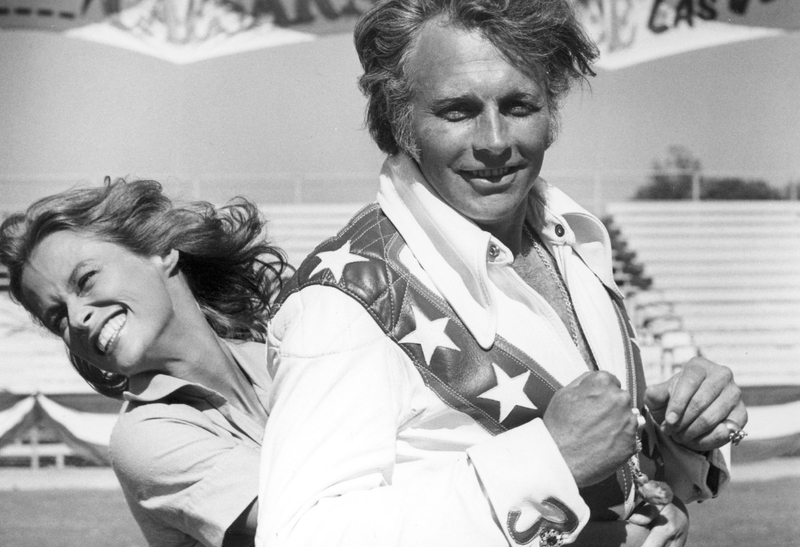 Knievel was worried about how the film would turn out because he hadn’t read the script yet. Rather than politely ask the director or producer for answers, Knievel drank a few too many and threatened Hamilton to read him the entire script. Hamilton ended up actually reading the whole thing, and thankfully, Knievel found the movie up to par. While Knievel had officially announced his retirement in 1975, he continued to perform stunts and make appearances until 1981. 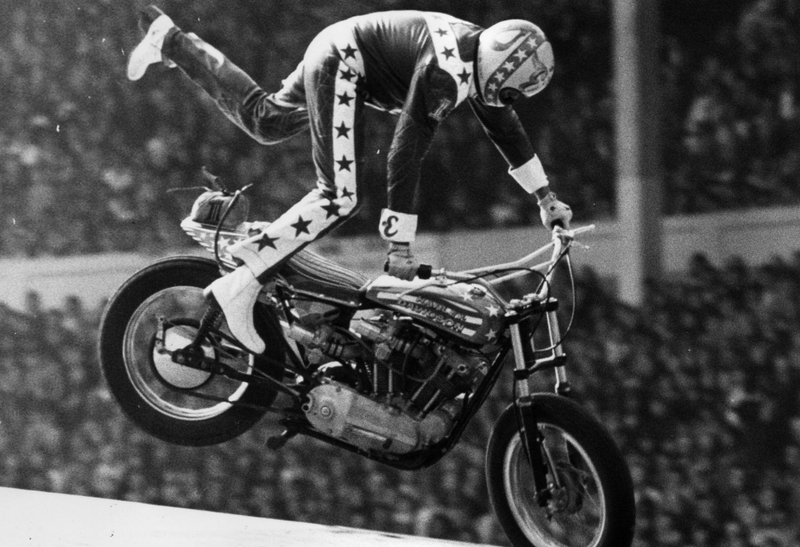 Most of those continued performances weren’t with Evel as the main act, but his son Robbie Knievel. Robbie began following in his father’s footsteps when he was only seven years old. When Robbie was eight, he performed with his father at Madison Square Gardens and by age twelve he was on tour with his father.